It began on a regular bike ride, along Grant’s Trail in St. Louis County, Missouri. “I’d ride past this apartment complex. You don’t think anything about it,” said Glynn Young, author of the Dancing Priest series. 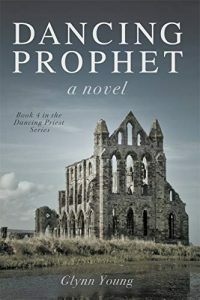 Book 4, Dancing Prophet, came out in October, but the story began in 2007, when Glynn learned that two young boys had been kidnapped and were being held in that apartment complex. Glynn wrote within the larger story he was already writing, which primarily takes place in the UK. By then, the worldwide sexual abuse scandal in the Catholic Church had been revealed. As he finished working his original story into Dancing Prophet, more reports about the depth of the scandal emerged. “It got really freaky this fall, when the stuff came out in Philadelphia. My publisher said, ‘They’re following your script,’” Glynn said. Not a how-to script; more of a how-not-to one. In the novel the Church of England takes a defensive stance as accusations and evidence and confessions mount. The how-to example for handling horrific abuse of children comes from the series’ protagonist, Michael. Fiction opens possibilities, and in Michael, Glynn has created a version of the three-fold office of Jesus Christ In book 1, Michael becomes a priest, and is assigned his first church in book 2. In book 3, he becomes king and starts popping in to preach the gospel in a way that displeases the Church of England’s high command. Those sermons are Michael’s first turn at speaking prophetically, but in book 4, when he discovers widespread corruption, he goes full prophet on the CofE. Even though in book 3, Michael senses that he is king for a reason, he thinks it’s smaller — you know, just whole-scale reformation of the Church of England. But in Dancing Prophet, he learns his role in the church is re-creation. There is a cost to doing the right thing: It means getting involved with hard stuff. We can be like the novel’s character Jane, who turns away from her boyfriend when she realizes his background included sexual abuse. She’s not sure about the whole thing. Her boyfriend seems okay, but is he really okay? Maybe it’s not worth the risk. So she breaks up with him. Like her, we readers may put the book down when it gets hard. But we should learn from Jane, who reconsiders when she realizes the abuse is much closer to home. Glynn calls that moment The Sunday Night Scene. It’s a moment we need to have — as readers, as citizens, as church members (no matter what denomination). What safer place to examine our world and ourselves than in a story? Because we never know who around us has been affected. The cover’s image tells a thousand stories. It’s a photo of Whitby Abbey, in Yorkshire. Established in 657 AD, the abbey flourished until 1538, when King Henry VIII issued the Dissolution of the Monasteries. Glynn considered several images of British cathedrals, some taken at night or with poor lighting. This one stood out. “That one is the story right there. It’s a church that’s a shell of itself. There’s also an element of blue sky, an element of hope about it,” he said. Dancing Prophet is available in paperback and ebook formats. If you haven’t read the Dancing Priest series, you’re fortunate to be able to binge all four books together. 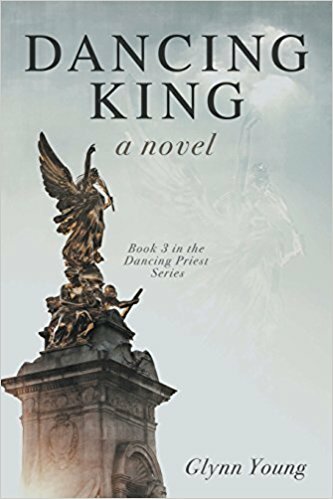 The third book in Glynn Young’s Dancing Priest series — Dancing King — released in December. Last month I read all three books (the first two were a blessed opportunity to reread). The stories haunt you, and not in a scary way. They serve as almost an alternate history: What if the Athens Olympics unfolded like that? What if England had a king on the throne instead of a queen? Like any good alternate history, it has enough true details to make it seem real. So real that I find myself thinking The Violence from book 2, A Light Shining, was as real as The Troubles. I am here as I am and here as what I have done. Who is Michael? Look at what he does. Michael is always fully himself, whether he’s on a bicycle, preaching a sermon in an Anglican church, or preparing to take the throne. In Dancing King, a significant scene happens at the Victoria Memorial. Wikipedia says that the central bronze is titled Winged Victory, above representations of Courage and Constancy. Those three sum up Michael Kent: victory, on the “wings” of a bicycle; constancy, his compass pointing to the true north of the gospel of Jesus Christ; and courage, but his club is a royal scepter. I met Glynn several years ago when he was an editor for The High Calling. We learned then that we both enjoy cycling, so our conversation started there. He talked about the scenes that snuck up on him, like the one at the Victoria Memorial. He also discussed tentative plans for upcoming books in the series, but I won’t go into any details. Who knows what Michael and Sarah and their children and England and America and the world might do next. Megan: How often do you get a chance to get on your bike? Glynn: If I can, I get out a couple times a week. I’m about a mile and a half north of a biking trail, and it takes me on about a 10-mile trail. I can go back and forth — there’s a side shoot off of it, mostly in one direction, which is up. It’s a hill. You’ve gotta go up about a 1/4-mile, then up a steep grade, then make a left. In London, I like to watch people bike to work. They don’t think twice about the traffic. One afternoon it was about 5:15 [p.m.] We stopped by Wellington [Arch], near Hyde Park Corner, and watched the bicyclers come — they come in wave after wave after wave. They cut through the parks, particularly on the way to north London. Hundreds and hundreds of bikers. The traffic in central London is just ferocious. They’re braver than I am or more foolhardy or both. Glynn: [Laughs.] I sometimes forget that it’s a fictional character myself. You go through three books with essentially the same cast of characters. I did know from the very beginning where this story was headed. As I was inventing this narrative, at some point I knew [Michael] would land where he landed. It kind of had this sense of this is what it’s rolling toward. Then came retirement, 2015. It wasn’t that I’d forgotten the story, but I couldn’t figure out how to get my head around what had to happen. It was getting frustrating. I came back, and I sat down and started writing. Nothing significantly new came — I had pretty much mapped out the key elements — but there were a couple things that developed. Scenes in particular that didn’t exist. A lot of this story has existed for over a decade in one form or another. One new one was when they’re on the plane, Michael tells Josh that he’s thinking of giving sermons. That was new. That scene at Southwark Cathedral, the first place he speaks — that was brand new. The scene, it just rolled right out of my fingers as I’m typing. The scene around the Victoria Memorial, that scene was brand new. That one still gets me. The Victoria Memorial scene came from — it just started happening and there it was on the page. It’s part of what happens and who he is and is particularly important for what happens later. A scene that I wrote that was also new, right after Southwark, the scene of Michael and Ian in the barn, mucking out the hay, from Ian’s perspective. [Dancing King] is sort of episodic. It’s not Michael telling the story anymore — he’s become something else. It’s about him. It’s the elevation of him [being king]. You get these different perspectives. It sort of pushed Michael up, that people are talking about him — they’re telling his story now. Megan: Since I read the series over two weeks, I kind of have the whole story in my mind at once. This book is different than the other two. Glynn: My wife was saying the other night, ‘I could see it.’ It had gotten a lot more precise. The first two [books] were essentially written before we went to London the first time. We’ve been five times since 2012. The biggest change was things got much more precise and I could speak with more authority about scenes and locations and directions. I think it helped. Of the three of them, I like the third one the best. I think there’s more knowledge and understanding and research. It’s a better book in a way. Megan: Back in book 2, A Light Shining, one of the plot points was that The Violence didn’t reach Northern Ireland. I went there in 2012 to cover the 100th anniversary of the Titanic, and our guide, a native of Belfast, said that when the city rebuilt, they used glass because now they had nothing to hide. Glynn: You said in a Tweet that The Violence was prescient. My wife said, ‘You need to stop writing about some of these topics.’ That whole original was written in 2005-2006, before the big terrorist attack in London in 2007, before a lot of terrorist activity on the Continent. I don’t think I was predicting the future, but there was some sense of something. These kinds of things happen when society and culture becomes very stressed. It’s how people act out their own anxieties and fears and ideologies. You think back to the Bible, the New Testament, a lot of upheaval in the Roman Empire. I think I’m trying to make sense of it in these books. Megan: On your Dancing Priest blog, you mentioned that it’s in the crowd scenes where a lot of the emotion happens. The thing I noticed is that there are different types of crowds in your books. If it’s a small crowd, like the size of a gang or even in the hundreds, then be afraid. But when you get into the large crowds, thousands and millions, it brings out the best in people. There’s goodness. That was unexpected. The motorcade in Dancing Priest, and all the crowds, millions of people lining the way. The crowds [in Dancing King] around the Victoria Memorial. They’re in the second book too. Megan: I’ve been bingeing on lectures by Dr. Peter Kreeft, who is a philosophy professor and a C.S. Lewis scholar, and one of the things he says is remarkable about the Chronicles of Narnia is that Lewis makes goodness attractive. I see you doing something similar in your series, and it’s hard to do, as a writer. Glynn: A woman who read the first book, she loaned the book to a friend and came back and said, ‘If I wasn’t already a Christian, I think I would want to be.’ It’s a very different picture that’s being painted here. There is something attractive about goodness. It’s so easy to stereotype it and make it clichéd, and I will tell you there were things I cut out because it was getting too clichéd. A pastor from Lexington, Kentucky, a 25,000-member megachurch, he had ordered the book for his staff and elder board. He said he’d never seen a better description of lifestyle evangelism. I thought, ‘I need to go back and read my own book!’ But I know what he was talking about. It’s how Sarah accepts faith. It’s got different details, but it’s based on my own experience. Unlike her, I wasn’t romantically involved. Other than that, I almost lifted off my own experience. These things always surprise me. There’s so much of your own self that a lot of times it’s so close you don’t even realize what you’re writing, You’re just telling this story. I didn’t write the story with the thought in mind. That’s how the story developed. [Michael] has flaws. He makes mistakes, but there’s something that speaks to the idea that this is what we’re supposed to be like, the direction. It’s about goodness. You can see elements of Christ in Michael, that desire to do what’s right even if it’s the hard thing. That’s who he is, and that’s going to continue to shape him going forward. Megan: Unlike a lot of Christian fiction, faith is certainly part of the story, but it’s not the point of the story. The story is the point of the story. But these main characters are people of faith, and so they live that out as their lives unfold. It’s not a happily ever after fairy tale. Glynn: These books don’t fit neatly into what most people think of as Christian fiction. My own experience has been that the audience is more non-Christian than it is Christian. Christians get impatient with these books because they’re not what they expect them to be. The Josh Gittings character, he’s got a lot of baggage. He’s done things he’s not proud of. He’s accepted faith and is now having to understand what that means. He’s having to realize and make decisions that he never really thought about. Behavior has to change, and yet this is not easy. It’s not a fairy tale. It’s life — in some ways it gets harder. He’s a political operative. He doesn’t fully understand it yet but he knows the way he has to go. I didn’t plan that. One of my personal favorites is the PR guy for the king, Jay. He’s a cultural Christian — this is what he was raised in. But something attracts him to Michael. Getting to know Michael and Sarah attracted Josh [to faith] too. Megan: You mentioned going to England five times since 2012. What other research have you done? Glynn: I took an online course on how Parliament works, just to understand. It’s very, very different from our system. I learned where the pressure points are, where the system could break. You get some glimpse of it in Dancing King with the actions of the prime minister. I’ve taken several courses. It’s a service, FutureLearn.com, all free, based out of the UK. It’s different universities that coordinate it. They have every subject imaginable. I’ve taken one on [William] Wordsworth, Richard III. None of is a terribly onerous way of doing research. 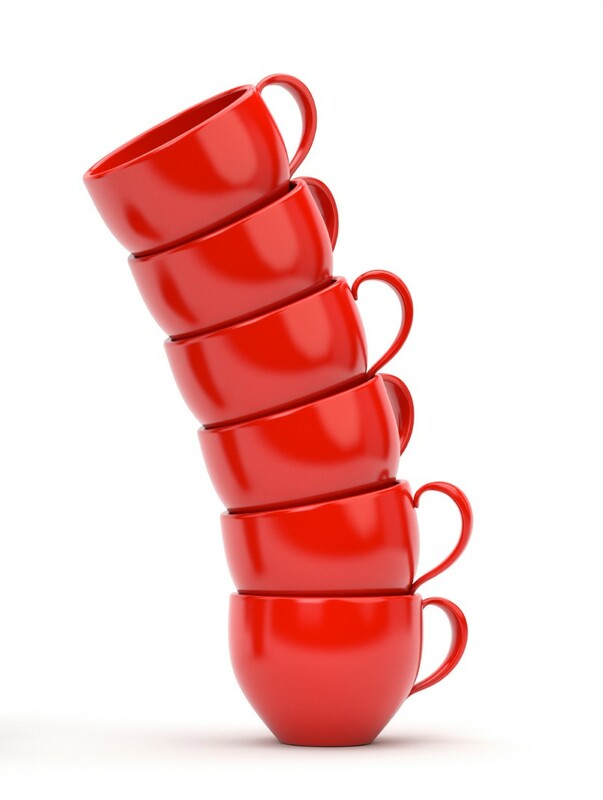 Megan: On the Dancing Priest blog, you said you have ideas for a total of 14 books. Glynn: The publisher and I sat down before I wrote the third one. He wanted to get an understanding of where my head was because there was a gap. I walked him through the main things that happen in books 4 and 5. This story arc is in my head. We’ll see how far the arc actually gets. One of my favorite scenes is in the first one [Dancing Priest], at the Olympics, when Michael and the British team are called into the stadium. A friend sat in my office after he read the book. ‘That scene,’ he just kept repeating, ‘I totally lost it. I had to explain why I was crying over a book.’ It’s so emotion packed, but the scene flowed naturally. Also, in book 2 [A Light Shining] Sarah’s press conference. Scenes packed with emotion, those are critical scenes. They’re in all three of the books. Some kind of transformation happens with those scenes — the characters are becoming bigger than themselves or something is happening that is bigger. When I read the proof copy of Dancing King, I couldn’t put it down. It was like forgetting you wrote it. I didn’t change anything. You gotta step back and make sure it’s holding together and feels accurate. I’d get wrapped back up in the story. Megan: That’s about all I have. Anything else? Glynn: When I wrote the first two books, I had a spaniel sitting on my feet. Writing, it’s such a solitary occupation. When you start thinking about what you’ve done, you think, ‘That’s kinda cool.’ I never thought I could do something like this. I could talk about this all day. 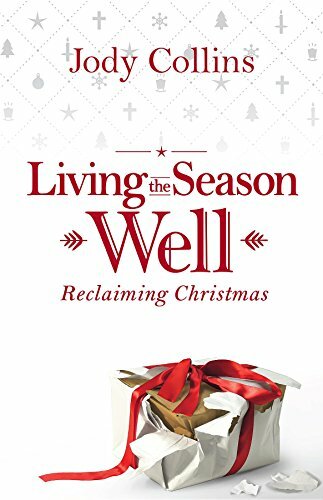 I started reading Jody Collins’ book, Living the Season Well: Reclaiming Christmas, shortly after Labor Day. I wish you could have started it then too. It was the perfect time — summer was over, it actually felt like fall (even in Texas), and there were still three turns of the calendar before Advent. “Start small. Start now,” Jody says in each chapter. This is a book to sit with and ponder and pray through. That’s how I read it and how I think I’ll still be interacting with it as Advent begins and all the way through Epiphany. This Christmas will be different because it will be our first one in a new home and our first as empty-nesters. This past December 26 at 6 a.m., we bought an artificial tree on clearance — a tall, pre-lit one — knowing we would finally be in a house with tall enough ceilings to accommodate it. I have purchased only one new ornament, from the city where our daughter is in college. It will be the first to go up. I’m considering decorating more slowly, like Jody suggested, “Add the ornaments a little at a time — there’s an Advent practice.” When we moved, we purged a lot of stuff (including Christmas stuff) so simply opening boxes will be an adventure. Unlike Jody, I was raised with the church calendar. I grew up Episcopal and became Catholic a few years ago. Advent is my favorite church season, and although I’ve been observing it for years, I’m always looking for ways to make it new. One thing I have not incorporated into those four weeks is any type of fast. In chapter 3, “Getting Ready: Preparing Our Homes, Heads, and Hearts,” Jody talks about fasting’s traditional role in Advent. I don’t know what we will be doing on Christmas Eve and Day, but they will likely be hard. There have already been two family funerals this year. Another loved one is going through an unwanted divorce. But guess what? I’ve lived through hard holidays before. The Christ Child always comes. What will we do this year? Frankly, I have never known what to do after December 25, so I loved chapter 6 on Twelvetide and chapter 7 on Epiphany. For the first time in a couple of decades I do not have a child on the K-12 calendar. (Some years the kids have gone back to school as early as January 2.) This year my daughter does not need to back at school until mid-January. That leaves plenty of time to play with those 12 days. How will I do that? Living the Season Well is for everyone — for those who have never known such a thing as Advent existed and for those who have always loved it. Because getting ready for Christmas is truly about preparing for Christ to “be born in us today,” as the carol says. And no matter what happens in our lives and whether or not those days are HGTV-worthy, the spell of darkness and winter always breaks. It was a sledge, and it was reindeer with bells on their harness. But they were far bigger than the Witch’s reindeer, and they were not white but brown. And on the sledge sat a person whom everyone knew the moment they set eyes on him. He was a huge man in a bright red robe (bright as hollyberries) with a hood that had fur inside it and a great white beard that fell like a foamy waterfall over his chest. Everyone knew him because, those you see people of his sort only in Narnia, you see pictures of them and hear them talked about even in our world—the world on this side of the wardrobe door. But when you really see them in Narnia it is rather different. Some of the pictures of Father Christmas in our world make him look only funny and jolly. But now that the children actually stood looking at him they didn’t find it quite like that. He was so big, and so glad, and so real, that they all became quite still. They felt very glad, but also solemn. “I’ve come at last,” said he. Check out Living the Season Well and ponder how you might prepare for His coming this year. One of the best things about living where I do is the cycling—routes and routes and routes along one-lane roads, up and down hills steep enough to receive categorization. During July and August I did several rides along a loop that passes the old Pecan Creek rural school. (Most of my bike routes pass at least one of these schools.) There’s a spot on Weinheimer where the road curves around a bluff, next to something between a puddle and a proper tank. It was at that spot on a Friday morning, the last Friday of summer, where I had a Battlin Billie moment. As in billy goats. As in the Fredericksburg High School mascot. Dave Campbell’s Texas Football readers named it the winner of the Mascot Madness contest. The district’s tagline is über alles, “above all.” My daughter attended through ninth grade and then graduated from somewhere else, an entire hour away. Moving her into that dorm was daunting, but looking back, it was the right decision for all of us. I was thinking about that move as I traveled downhill, headed into the curve, when all of a sudden I saw movement on the private road coming down the side of the bluff. It was about two dozen goats, and they were making a run for it. They charged down the unpaved road: Free at last! They moved as one bleating mass, bolting up the hill I was riding down. So I slowed. Some of those fellas had horns. Just as I braked, they saw me. They stopped too, right in the middle of the hill. It was a small standoff. I’m sure they’ve never seen anything less threatening than me—a middle-aged woman on a hybrid Trek bicycle. But that bright headlight? That black helmet? You never know. Might mean trouble, right here in River City. When I was a kid, I used to ride my bike all over the neighborhood during the summer. I’d meet my best friend, and we’d go over every road, up and down hills. Even riding with someone, I always felt independent, as in control as any 11-year-old could. Although I could have left the neighborhood, I never did. Where would I go? I wouldn’t have known what to do with complete autonomy. After a few uneasy moments, the goats scattered, their untidy monolith dispersing in at least three directions, along with their dreams of wanton consumption of paper goods. Still, I admired their gumption. They saw their chance and took it. Those goats were more daring than I’d ever been. I resumed pedaling, not looking back. The feeling at that point on that particular ride, the hardest hills behind me, is pure freedom. The rains had made the Russian sage pop out, and the sun played peek-a-boo with the clouds while mourning doves whinnied. I felt 11 again, unrestrained within my confined space. Four days later my daughter and I boarded a plane. Unlike her first move into a dorm, in which we filled the bed of my husband’s pickup truck with everything under the sun, this time she was moving by airplane, and we had only the allotted number of bags. But unlike those goats, she knows where she’s going. Above all, she wants the chance to explore outside the neighborhood/state she’s always known. At the end of our journey, I left her in a dorm at the top of a hill. As I walked back down, toward the hotel, I did not look back. I’ve watched Kristin Schell’s Turquoise Table journey from afar (not that far — we only live 75 miles apart), and I was inspired. 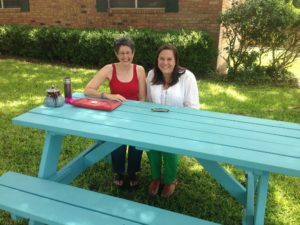 I wrote a column about her turquoise table and my neighbor, Smokey Joe for the WACOAN. Then my husband built our own table, and I painted it turquoise . Kristin and me, summer 2015. 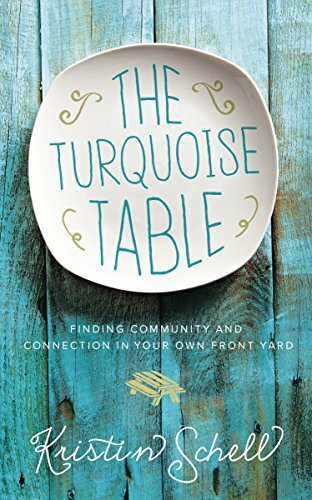 In June, Kristin released her book, The Turquoise Table: Finding Community and Connection in Your Own Front Yard. This book isn’t one I’m setting aside or passing on to a friend. No, this one is going on my cookbook shelf, so I can grab it often. The shelf already has many, many printouts of Kristin’s recipes from her blog. The book isn’t just about a picnic table. It’s about hospitality — from Kristin’s F in high school French to the Front Yard People movement. Hospitality is one of those things: You know it when you see it. If you ever meet Kristin, you’ll see it. There are two women in my family who consistently show hospitality. One is my Aunt Fayma. For years she hosted Drummond Christmas at her house in Hamlin, Texas. Her motto was, “Come early, stay late,” and we did. She never knew exactly how many people to expect, but she welcomed everyone. Throughout the year, when she found snacks or drinks on sale, she’d stock up. The person who bought her old house is extremely blessed. The other person I think of when I think of hospitality is my sister-in-law, Amy. She has hosted many a Christmas as well, also to an unknown number of guests. But I think the moment she captured my heart was when she made her house the go-to destination during my mom’s funeral. One day she served everyone lunch, from both sides of the family. Family from Wyoming met family from Oklahoma and Alabama. She especially showed hospitality to me the week my mom passed away, as I wrote about in The Joy of Poetry. Unlike Aunt Fayma and Amy, hospitality doesn’t come easily to me. (It does to my husband.) There was a time when I not only lost my few welcoming shreds of decency but also the entire ability to cook. That’s why Kristin’s chapter “The Broken Table” was so meaningful to me. She describes when her turquoise table broke during an interview/photo shoot. One friend thought the picture of the broken table wasn’t suitable for the newspaper. For a long time our table was empty. Food became a weapon; the table, a battleground. The best I could do was to keep separate food stocked for each separate member of the family. Then there was the night we dared to order Domino’s and share it as a family. We survived. Finally, with Kristin’s recipes in hand, I braved the stove, the oven, the CrockPot. I wore an apron and played music in the kitchen. The table stayed broken, but the food began to build connection. Like Kristin’s broken picnic table. Truthfully, I needed the visual reminder of the broken table. The cracked wood and splintered bench was hard-earned — weathering the hot Texas summers and two years of carrying the emotional and physical weight of those who gathered. We joined a small group at our church. We gather once a month for prayer and study … and a meal. Whatever my assignment was — salad, bread, appetizer — I’d bring a Kristin recipe. People started looking forward to my dishes, even to my desserts, which I rarely make. And it’s kinda vulnerable. When we make the table a place to, as Kristin says, Gather Small, Love Deep, we find out hospitality isn’t about matchy-matchy and Instagram-worthy dishes. It’s about a space where we can talk about our lives. Our new yard won’t support a turquoise table, but it will accommodate turquoise Adirondack chairs. They are built but not yet painted. On our new street, neighbors actually do come out and visit in the evenings. But I think the bigger story is our table inside, the one we bought for our first home, 21 years ago. The one at which no one sat for a long time. The one that got broken but is again becoming a space where hospitality can happen. I made the Turquoise Table M&M Cookies, recipe from Colleen Enos, for our family. No table was involved — I just placed them on cooling racks, and they got eaten up. Baking them was hospitality for us, to celebrate our new convection oven and the start of summer, perhaps our last one together because our youngest leaves for college this month. I told Kristin the cookies were a hit, and like all good hosts, she was gracious. “It’s the shortening,” she said. If you want to check out other spots where Kristin’s been taking her turquoise message, check out the Turquoise Table Collection at Tuesday Morning, and the variety of outlets where she has done interviews, including the Today show. We took my dad to see “In the Heights” at the Zach Theatre in Austin, Texas, for Father’s Day. He loved it. We loved it. But best of all, this musical about a New York City neighborhood I’ve never seen gave me back my mom, both while I was at the show and each time I’ve listened to the soundtrack thereafter. I can’t believe Lin-Manuel Miranda started writing this when he was in college. Doesn’t that mean it should hit the three Ds: dark, disturbed, and depressing? But “In the Heights” is none of those. We get “Paciencia Y Fe,” patience and faith. Also love and a profound sweetness. How did he write Nina’s parents so well before he became a parent? My husband teared up at Kevin Rosario’s “Inútil,” the lament of every father watching a daughter grow up. And Camila Rosario’s “Enough” — don’t you think Linda Loman from “Death of a Salesman” seriously needs to sing along? Because my Spanish-speaking mama raised me, I think alabanza sounds prettier than “praise.” “Sunrise” is nice, but amanecer sounds musical, especially when Nina and Benny sing it as a duet. Even no me diga, as compared to “you don’t say” or “don’t tell me” is, well, mejor. Ever since my mom died seven years ago, hearing Spanish or someone speaking with some sort of Spanish accent undoes me. (And I live in Texas, so it happens a lot.) Spanish means she’s here. That’s because Merry Nell Drummond often spoke Spanish. She learned it during the summer she spent in Mexico City after high school, and she learned more when she met my father on a University of Texas student exchange trip to Chile a few years later. In the 39 years I knew her she was always happy to translate for anyone who needed a little help navigating a grocery store counter or a doctor’s office or what have you. When my parents wanted to say something they didn’t want me to hear — often something lovey-dovey — they spoke Spanish. There was a note on Genius.com about that third line, that the traditional way to say “God bless you” is Dios te bendiga, so the line could read, “And if you lose the way, God bless you.” I like that. Because I did lose my way for a while when my mom died. The word huellas literally means “footprints,” and I can say that with Mom’s footprints gone, mine were no longer as steady. So I wrote 72 poems about her, and eventually I was able to continue walking on the path. I guess I’ll keep walking it for the rest of my life. 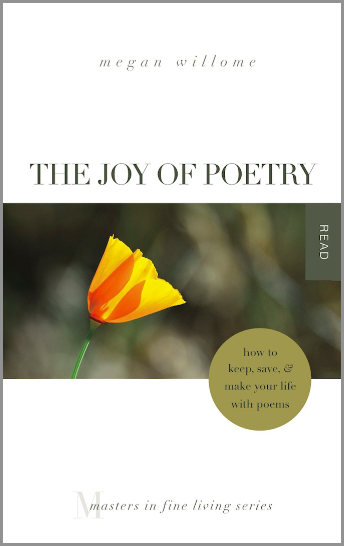 I’ve said here that the reason I wrote The Joy of Poetry was because I was asked to do so. But the process of writing it turned into an alabanza, a praise of my mother. Bond purchased the original bear at Selfridges department store. Once he started writing, he pictured the bear with his blue duffle coat and red hat and brown suitcase looking like the London children who were evacuated during the Blitz. Paddington arrives at Paddington Station from “Darkest Peru,” sent by his Aunt Lucy, who can no longer care for him because she has to go into a home for retired bears. 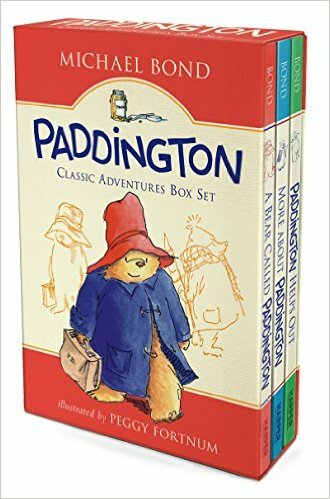 In “A Bear Called Paddington,” the Brown family discovers the bear at the train station while picking up their daughter for summer holidays. Bond wrote many more Paddington books, the latest of which, Paddington’s Finest Hour, was published in April. Guess what? Even though Paddington was my nursery theme, I never read a single one of Bond’s books to my son. I read him plenty of other children’s books by British authors. I read A.A. Milne. I read Beatrix Potter. I read Kenneth Grahame. Why not Paddington? Because I doubted myself. Was a refugee bear really the best choice for a baby? Was I even fit to be a mother anyway? There still was hope for me and my relationship with this bear. I headed to the library. Our library is a bit like a garage sale — you never know what you’ll find. I arrived during the summer storytime. A man was doing a demonstration with a live python. Mr. Bond, you died too soon. You could have written “Paddington Meets a Python.” Pity. 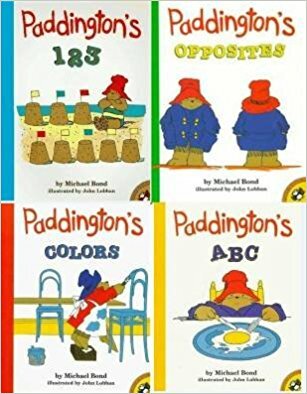 The other four Paddington books were learning books: a counting book, an alphabet book, a book to teach colors, and one to teach opposites. As I read them, I had a surprise: I owned these books. My son and I read them together. As I reread them it all came back. Seventeen jam tarts. An open suitcase filled with jars of marmalade contrasted with a closed suitcase. The color book uses pictures to illustrate how red and white combine to make pink — when Paddington uses the washing machine. And in the alphabet book L stands for “label.” Of course it does. So my son must have thought that Paddington was a bear who taught concepts like numbers and letters. Which is not untrue. But by skipping the stories I failed to show him that Paddington is also a bear who teaches about optimism, politeness, and generosity. Despite bragging that I don’t throw out children’s books, I no longer own those four. At some point I must have given them away, probably to the annual book sale put on by the Friends of the Waco-McLennan County Library. But here were those same four books, in a library 180 miles away, on my son’s birthday, the day after Michael Bond passed away. How does that happen? Well, when you cast a bear on an ocean liner, in a lifeboat, with a note from a loved one, somehow he finds his way to a safe place, even if that place is very, very far away. My friend Sharon Gibbs recommended this book to me, and L.L. Barkat recommended it to her. I’m always up for a good picture book — one whose words and pictures work together to tell the story. This one was published in 1982 and won the American Book Award. The Lupine Award, presented by the Maine Library Association, got its name from this very book. The fictional story — which feels real — is about the Lupine Lady, a little girl named Alice who, over the course of her life, finds a way to take her grandfather’s advice: “You must do something to make the world more beautiful.” That something has a lot to do with lupines. 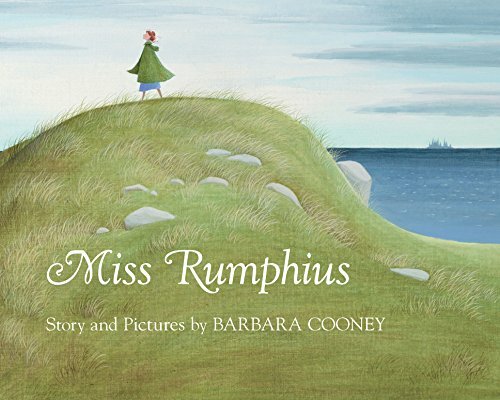 After working as a librarian, Miss Rumphius travels the world. When she goes to the Land of the Lotus-Eaters, the text says, “and there, getting off a camel, she hurt her back.” In the picture, she’s pressing her hand into her back while she rides the camel sidesaddle. By my math, she’s down for an entire year: from spring, through summer, then “a hard winter.” Then spring comes again, and “Miss Rumphius was feeling much better.” That’s a long time to be in bed, girlfriend. Even though this story is fiction, I don’t believe this narrative choice is careless. Barbara Cooney illustrates this page meticulously, and the words she chooses to describe Miss Rumphius’s state are “not very well,” as in “The next spring Miss Rumphius was not very well.” Wait, don’t you mean “not feeling very well”? Nope, that is not what Cooney says. She says, “not very well.” That’s not a feeling; that’s a diagnosis. I don’t think it’s answer A. If it were, Miss Rumphius would be unable in the next few pages to “take walks again,” to “go up and over the hill,” to wander “over field and headlands,” and to ride a bike. The text tells us, “Her back didn’t hurt her any more at all.” That’s wonderful. The lupines she scatters are lovely. But what do we miss when we skip ahead to the flowers? We miss the pain of a year in bed. We miss the agony of the page before the year in bed, when Miss Rumphius buys her long-dreamt-of house by the sea and declares herself “almost perfectly happy” (italics in the text). I think her almost-happiness is about more than finding a way to fulfill her grandfather’s admonition to fill the world with beauty. I think she is lonely. But, oh, Alice, there is one thing more. You must let people in. You may hurt your back or your foot or your elbow in the course of your adventures, but please, dear girl, don’t hurt your heart so badly that you are unable to move for a year. Let your home by the sea be filled with children and critters. Serve cookies and tea. Tell your stories. In July, John and I will celebrate our 25th anniversary. I have sworn that the secret to a happy marriage is separate bathrooms. Really and truly, that’s the only advice I’ve ever shared with newlyweds. As soon as we moved into a place with two bathrooms, I took over one of them. And thus it has stayed — through moves, through pregnancies, through children, through two houses with tiny master bathrooms, the kind we could only share if one person stood at the sink and one sat on the toilet. There is such a thing as too much togetherness. And then we bought a new house. Built in 1999, this one is the newest we’ve owned. This master bathroom is, in a word, vast. There are two sinks (please applaud). Not only could one person stand and the other sit, but one person could do a cartwheel while the other shaves. Have I tested this theory? Has my husband done a cartwheel while I shaved my legs? What happens in the bathroom stays in the bathroom. One month into this new level of cohabitation we’re doing well. We’ve lived together long enough and endured sufficient crises to rise to meet this new challenge. Okay, it might be that after 25 years we’re set in our ways. We shower at different times — him, before work; me, after exercising. The only time we get ready simultaneously occurs before church. Although, to be fair, I have discovered a privacy option: a walk-in closet. This is another luxury we have not had previously, except during our first year of marriage, when the only apartment available was a unit built for wheelchair accessibility. But this closet dwarfs that one. It’s so big we moved in our dresser. Because we could, that’s why. One of the dogs claimed the corner under the built-ins as her den. Heck, both dogs could co-camp in our closet. They’re only terriers, after all. But I bet we could get two Labs in this closet. But then there would be no room for our shoes. However, if we had Labs, they’d eat all our shoes, so there you have it. No Labs, safe shoes, happy terriers. I have seen bathrooms and closets bigger than ours in the pages of the WACOAN magazine. I have interviewed homeowners for those pages with grander porcelain palaces. Some have not only two sinks, a shower, a toilet, and space for cartwheeling, but also a tub. Our master bathroom lacks this amenity. If I want to take a bath, I have to walk to the other side of the house, to the guest bathroom. In which I have already taken over a drawer and most of a cabinet. Because some days, even in the midst of halcyon marital harmony, you need your own bathroom. Two mornings ago I woke up thinking about scorpions. A friend had written a poem about them — creatures unfamiliar to her but common here, where I live. And immediately I thought of the handmade scorpions the Mexican artisans create and leave for visitors to buy at Big Bend National Park. See the scorpions, made of wire and beads? Note the price list to the right. The soda bottle is where you, as a tourist, put your money. When my dad and I went to Big Bend six years ago — this very week — we saw these makeshift shops everywhere. We stayed at Chisos Mountain Lodge, built by the Civilian Conservation Corps. Want to see the creators of this folk art? These two men are wisely sitting in the shade because even in February, it’s hot in the Chihuahuan desert in the afternoon. 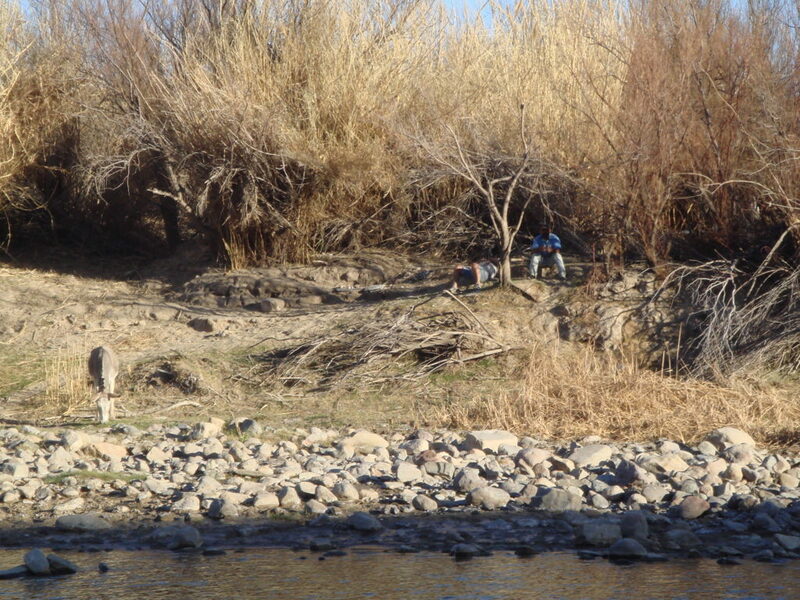 Presumably, in the evening they walk across the trickle that passes for the Rio Grande at that spot and gather their money, replace their wares. 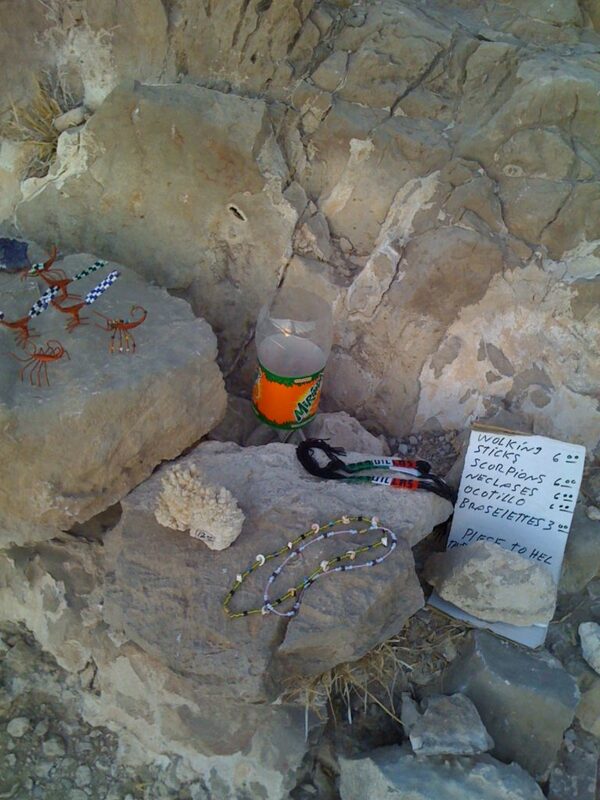 This is what the border looks like, near the scorpion sellers. Can you tell which side is Texas and which side is Mexico? Big Bend National Park is 801,163 acres, making it the 15th largest national park but one of the least visited, due to its remote location. The border with Mexico within the park stretches 118 miles. On the U.S. side is the national park, and on the Mexican side is Maderas del Carmen, a protected reserve. 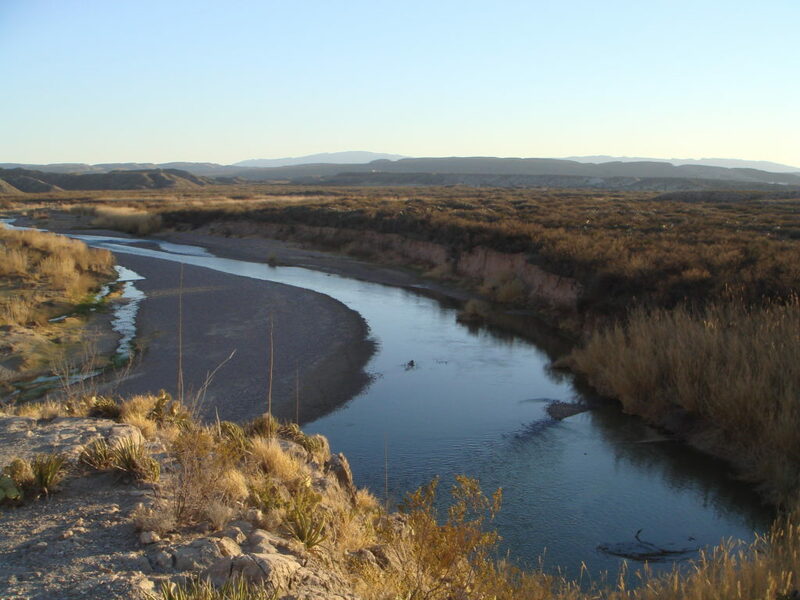 The cooperation between the U.S. and Mexico has increased the migration of wildlife to and from both sides in an area roughly the size of Connecticut. The park was officially established by President Franklin Delano Roosevelt on June 12, 1944. Look at that date for a moment. Do you know what event occurred only six days earlier? D-Day.